Vapor extraction tests and pump tests were performed to design a full-scale remediation system including soil vapor extraction with thermal off-gas treatment. A 2,500-gallon gasoline release created significant vapor problems in homes and businesses throughout a two-city block of downtown Dover, NJ. Indoor air concentrations in nearby buildings required extended evacuation of occupants. Of particular concern were a tavern/restaurant, a 4-story nursing home and an office/bank building, all of which were immediately down gradient of the release. 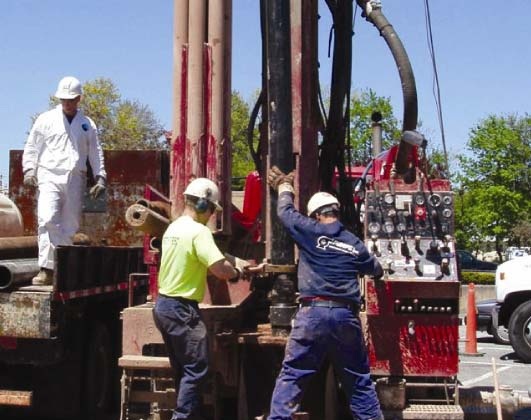 The New Jersey Department of Environmental Protection (DEP) activated Handex as consultant and contractor to mitigate these problems under the State’s Subsurface Remediation Contract. We immediately began venting sumps in the basement of the bank building. In addition, wells were installed by hand throughout the basement slab to check for product and to use as soil vapor extraction points. Concurrently, 25 wells were drilled around the bank, nursing home and tavern to determine geology and presence of liquid phase hydrocarbons. 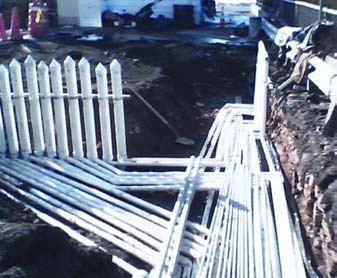 As wells were installed, short-term vapor tests were run. Internal combustion engines were mobilized and manifolded to highly contaminated wells to recover hydrocarbons and minimize vapor impacts. The engines, manned and operated 24/7, recovered on average 35 gallons per day each during the first several months. Vapor extraction tests and pump tests were performed on select wells to design a full-scale remediation system. The final system was soil vapor extraction with thermal off-gas treatment. Localized dewatering was necessary to expose hydrocarbons trapped below the water table. 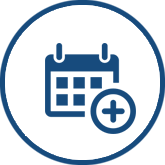 Two complete systems have been installed; one to treat the bank property, the other to treat the service station, nursing home and bar properties. 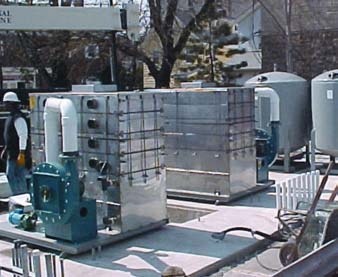 The treatment train includes two 100-gpm low-profile air strippers with GAC polishing units, along with thermal oxidation treatment of off-gas and soil gas. Our licensed technicians continue to operate these systems.